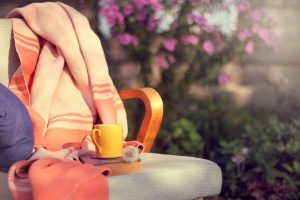 As the weather starts to shift from summer to fall, property managers with open-air seating and outdoor patios often wish there was a way to extend the warm season just a little while longer. After all, these amenities are often a valuable draw for customers and allow you to maximize your occupancy. The good news is that there are many ways to do just that! From installing commercial-grade retractable awnings to embracing the cool weather as a part of your brand’s charm, here are some tips for making your patio more appealing during the autumn season. If the autumn brings gentle rains, retractable awnings can provide protection for your guests if an unexpected shower passes through. However, the real value in a retractable option (versus a stationary one) is that you can let the sun warm your guests with a push of a button. You’ll never have to choose between weather protection and access to those last blissful rays – extending your patio season long past the fall equinox. The cooling temperatures outside don’t necessarily mean cold evenings on your patio. By pairing your outdoor heaters with retractable awnings, you can trap more of the heat where it counts. For properties that have strict rules about propane or gas usage, companies like Infratech offer electric infrared heaters that deliver great results. Whether you’re choosing over-stuffed sofas and chairs for an outdoor lounge or adding thick seat cushions for outdoor dining, your autumn furniture should be warm and cozy. You should also consider laying blankets strategically around the space, so guests can wrap themselves up without having to ask. 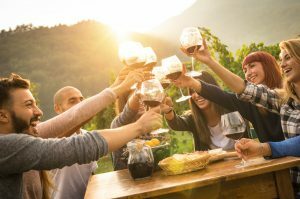 The key to extending your outdoor season is to show your guests that you’ve thought of everything they’ll need to stay warm while enjoying their time in the open-air. There are many ways to fold the cooling weather into the charm of your property. From a warming drink list with hot toddies and spiked cocoa to hearty winter meals, you can make the autumn weather a part of your brand. If your clientele is on the playful side, consider delivering mittens and scarves with the patio menu. The options are endless. Are Retractable Awnings the Ideal Autumn Comfort Solution for You?